Let these enticing lobby chairs set the tone in your waiting area. Wide armrests separate individual seats so everyone can have a comfy personal spot to enjoy as they wait. Looking for some distinctively modern reception chairs? Look no further. From brushed aluminum cylinder legs to a plush dual-upholstered design, these Accompany Metal Leg Reception Chairs will make any lobby more inviting - and really first-class. Waiting room chairs are one of the first things to greet visitors as they enter your office so you want to make sure that they reflect the style and class of your company. Large welcoming seats and cozy contemporary fabrics will help your clients and colleagues sit back and relax as they wait for a meeting or appointment. Extra-thick cushions with a sinuous spring suspension will keep visitors comfortably cushioned in these reception chairs for many years to come. Personal Space: Large padded armrests create the feel of individual seats while saving you space. 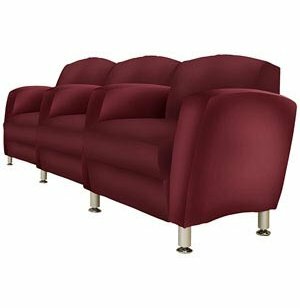 Sleek Stability: Chrome feet with leveling glides accent the upholstery and keep chairs standing straight. Durable Design: Double-needle (baseball) stitching reinforces the high-quality upholstery. 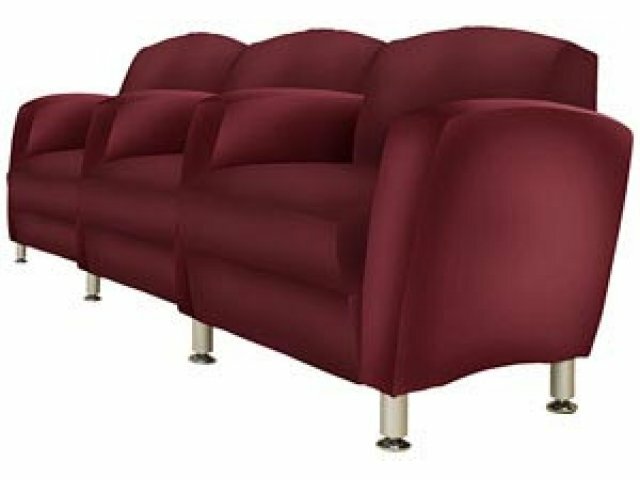 Luxurious Cushioning: Extra-thick, high-density cushions with no-sag, sinuous-spring suspension facilitate super comfortable positioning. Color Variety: A huge selection of upholstery colors lets you match hues or bring new shades into your workspace. Perfect Match: This reception seating series coordinates perfectly with The Malibu Tables.